Mitzi Stauffer was raised in Bay Area, an only child and the heir to the Stauffer Chemicals fortune. She attended Stanford University, where she studied philosophy, psychology and education. After three years of college, she left to marry her professor, a scientist. For years she worked with him doing his research in Northern Nevada. At 21, she lost her family and used her inheritance to begin investing in real estate. She had a natural aptitude for this investing and established herself as a shrewd businesswoman. She was drawn to Las Vegas by the potential profit that gaming ventures represented. 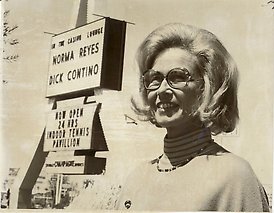 She was approached about a business venture at the Tropicana Casino, and became the majority owner in 1975. As acting director of the Tropicana Hotel Corporation, Briggs added a twenty-two story hotel and oversaw many other significant renovations and expansions to the casino. Unfortunately, unbeknownst to Briggs, some of the other investors in the casino were operating a skimming operation at the direction of an East Coast-based organized crime syndicate. When the operation came to light, Briggs was forced to sell the Tropicana, and the Ramada Inn corporation purchased the property. Briggs was a talented and successful businesswoman whose losses at the Tropicana are sadly representative of the era when Las Vegas was tainted by ties to organized crime. After losing the Tropicana, Briggs turned to her religion for solace and guidance. She has spent the last several years working for the Shrine of the Most Holy Redeemer, assisting the priests with weekly services and working as a salesperson in the gift shop.